Black and white photograph of the Readicut Wool Shop c.1950. The photograph was produced by shop fitters Drake and Water Ltd. of Wakefield. The Readicut Wool Company was founded by Ralph Hirst in 1928 and was based a Terry Mills in Ossett. Hirst had the idea of supplying pre-cut wool which would save home rug makers the time and effort of carefully cutting yarn to size. In 2013 Readicut was still trading as part of the Orbital Group. 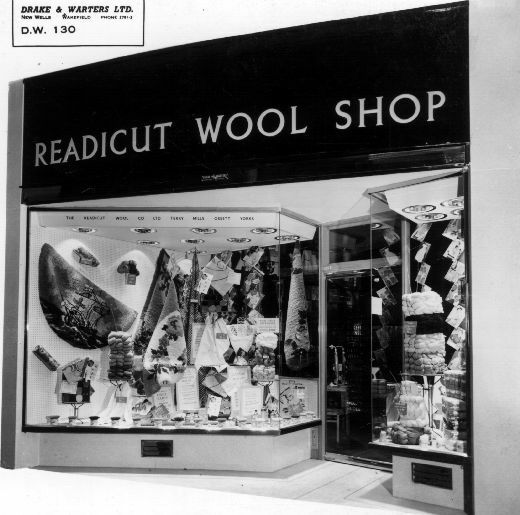 This shop, belonging to Readicut Wool Company of Osset, was fitted out by Drake and Warter Ltd. of Wakefield.